Did you ever make a potato clock? A couple of spuds, some wire and a small digital clock is all it takes. What makes it work? The same thing that creates galvanic corrosion on your boat. Two dissimilar metals in a saline solution. Put a boat into Puget Sound and you have a big floating battery. Something will corrode – the trick is to manage that corrosion so the good parts of your boat don’t turn to dust. If that same boat has any electrical devices on board, and most do these days, you have a potential electrical safety hazard and a stray current corrosion risk. Careful maintenance of on-board electrical systems and safe handling of shore power equipment is an important part of an enjoyable day on the water. 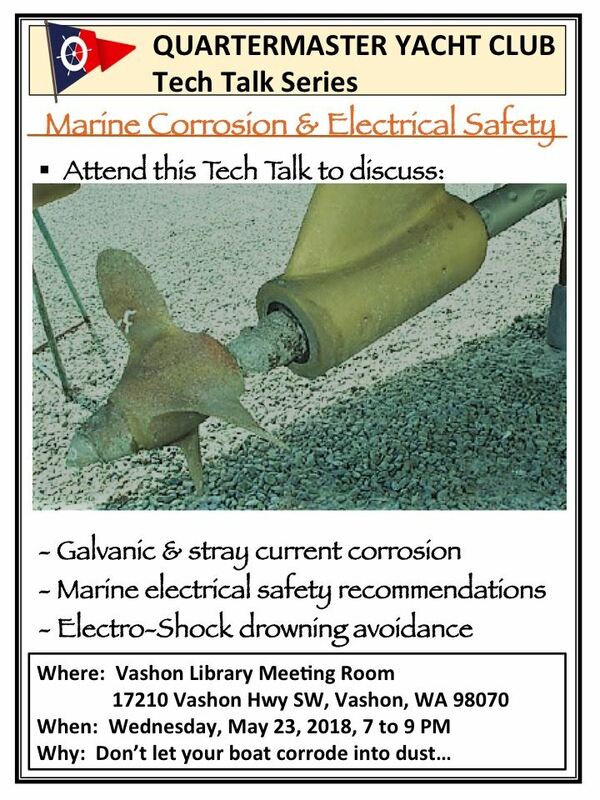 Stop by at this Tech Talk on Wednesday, May 23 at 7PM in the Vashon Library meeting room to learn how to keep both you and your boat safe.